2017 marks two anniversaries in the evolution of our interdisciplinary design studio. Forty years ago, Michael Reed, established Mayer/Reed focusing on the intersection of product design and visual communications. 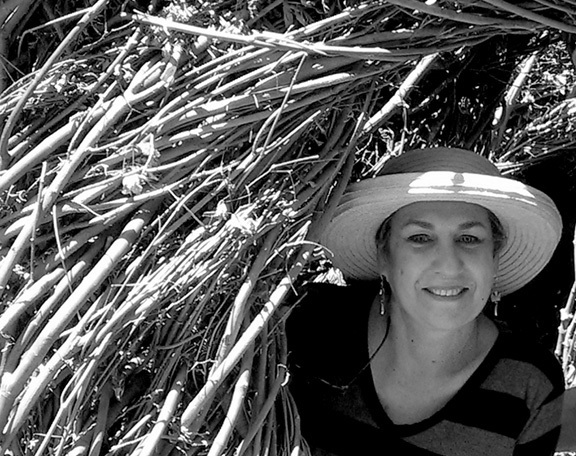 Ten years later, Carol Mayer-Reed joined the practice to form a larger multi-disciplinary partnership that includes landscape architecture and urban design. With the more recent addition of Kathy Fry and Jeramie Shane as principals, the practice continues to expand and evolve and is now a studio of 26 diversely talented professionals. Throughout our 30/40 landmark year, we are exploring the nature of community and place through reflections, observations, and images of Mayer/Reed’s work culminating in a “Beyond Opening Day” photo exhibit. The November exhibit will explore the story of place and identity as seen through the lens of users. As designers, we are interested in learning how our projects have taken on a life of their own. Photos by @stegosaurus, @da_snipa, @julierosedesign and @portlandchildrensmuseum. What are your experiences in the places that Mayer/Reed has designed? Have you captured special moments or a remarkable shaft of light? The American Society of Landscape Architects has elevated Teresa Chenney to the ASLA Council of Fellows in recognition of exceptional accomplishments over her thirty-year career. Fellowship is among the highest honors the ASLA bestows on its members. An Associate and senior designer at Mayer/Reed, Teresa is being recognized in the Works category for a body of award-winning projects that have contributed to the Pacific Northwest’s reputation for outstanding public spaces, sustainable practices and urban design. Teresa’s significant projects include the Nike World Headquarters North Campus Expansion, Phase II of the Vera Katz Eastbank Esplanade, Simon and Helen Director Park and the Rain Garden at the Oregon Convention Center. Teresa’s many volunteer activities are consistent with her ideals and commitment to public good and environmental stewardship. She is a selfless advocate for the very best design, and is highly respected for her outstanding contributions. Teresa’s professional life has included work in major firms in San Francisco, New York and Portland. She joined Mayer/Reed in 1997 to design the Nike World Headquarters North Campus Expansion project. The 2017 class of 23 new Fellows will be recognized at the ASLA Annual Meeting and Expo, October 20–23, in Los Angeles. Mayer/Reed has promoted Ryan Carlson and Elizabeth Talley to Associates in recognition of their leadership. Ryan Carlson, LEED AP is a registered landscape architect and project manager. His professional pursuits range widely from urban projects such as the Hyatt House Downtown/Portland and the Franklin High School Modernization to parks and ecologically focused projects such as Portland’s Willamette Park Improvements and the Ebey Waterfront Park and Trail in Marysville, WA. Ryan holds a Master of Landscape Architecture from the University of Oregon. He joined Mayer/Reed in 2005. Elizabeth Talley, SEGD is a visual communications designer and project manager. She has been with Mayer/Reed since 2011. Her design leadership in wayfinding and experiential graphics focuses on economic development and user experience. Liz’s recent projects include LOCA/Goat Blocks development, 333 Dexter Office Building, Prometheus Real Estate Group and Legacy Emanuel Medical Center. She holds a Bachelor of Fine Arts from Louisiana State University and volunteers for Venture Portland. Planning a new park at SE 150th and Division posed a big challenge: How do we meaningfully engage a culturally diverse community in a park planning process? Among the people who call Centennial neighborhood home, some have lived through annexation by the City of Portland, some have moved east from the central city, some are first generation immigrants, some are second generation, and some are recently resettled refugees. English, Spanish, Russian, Nepali and Somali are all spoken here. Knowing that a 7.3-acre site cannot address every need in this park-deficient neighborhood, how do we as designers prioritize activities and create a shared park vision? 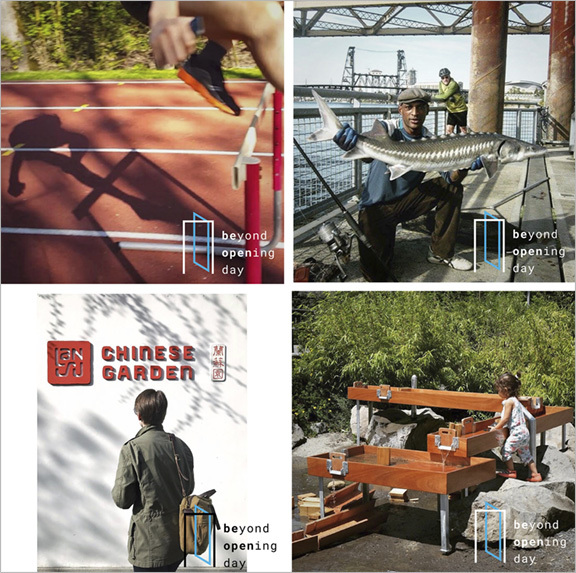 In collaboration with Portland Parks & Recreation (PP&R), Mayer/Reed developed a creative and inclusive approach to meaningfully engage the community. Graphics that communicate ideas without language are an essential part of our outreach. Community liaisons help neighbors from different cultural backgrounds feel comfortable with the public process. And food and child care boost attendance at public meetings. Last July, PP&R held a “Party in the Park,” where nearly 100 neighbors cooked and ate together, played games and participated in planning exercises on the future park site. 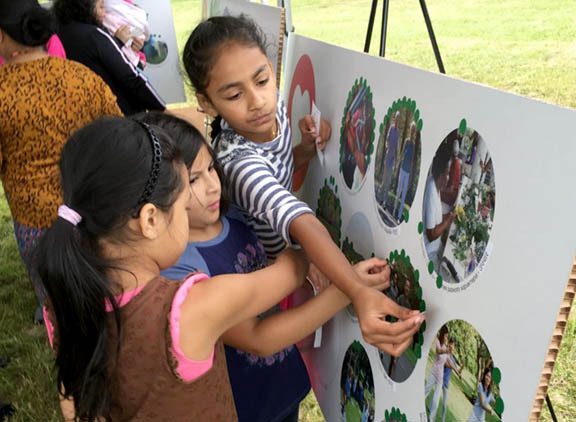 We engaged attendees with colorful image boards depicting a variety of park activities and a site model where people flagged possible locations for activities. Community gardens, group gathering spaces and sports emerged as common themes. A followup community event in October invited participants to arrange and prioritize scaled templates of amenities such as sports fields, playgrounds and gardens on a site model. 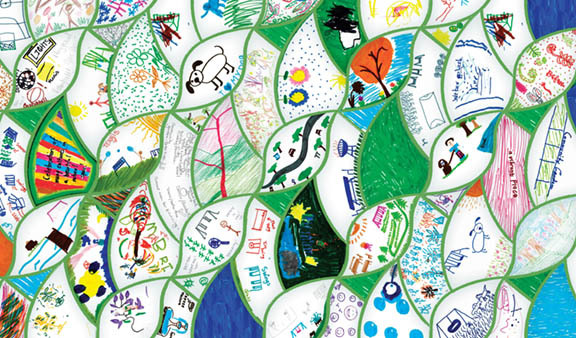 A separate art activity encouraged young and old to depict their ideal park experiences, which we then composed into a colorful “tapestry” to represent the shared vision. 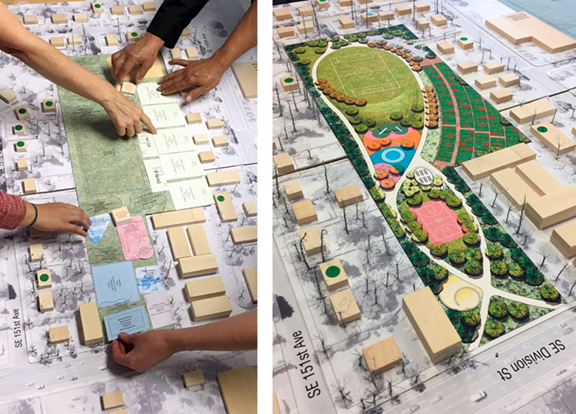 Inspired by this exchange of ideas with the community, Mayer/Reed created two design options for the park which we presented at a community meeting in April. Consensus was reached for some elements, while others (like a dog park) continued to generate fruitful discussion. Building on this critical input, we’re now finalizing a single park concept. This process has demonstrated that comprehensive outreach and participatory design activities (despite language barriers) can bring many different people together to shape a space that is destined to become a social hub of activity for the neighborhood.